It was a warm Sunday morning and a sizeable crowd listened in rapt attention to Dr B N Vishwanath at the Celebrity Paradise Club house in Electronic City on January 8th. Dr Vishwanath, the organic kitchen garden evangelist, was talking about the importance of growing one’s own food. Apart from health benefits, especially for children, the physical exercise of gardening outdoors also keeps you fit, he said. Visitors buying plants, seedlings and tools. Pic: Meera K.
Vishwanath presented some facts on the food that we eat today, emphasising on the dangers of pesticide-laden food. He and his colleague S Laxminarayanan from Garden City Farmers Trust gave practical advice on terrace and balcony gardens – the basic steps in planning a garden, soil, grafting, seeds, seasonal plants, tackling pests etc. 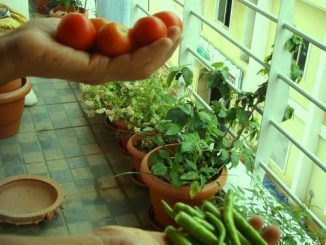 They shared pictures and success stories of amateurs growing their own vegetables like capsicum and brinjal and fruits like the papaya and grapes in small balconies. 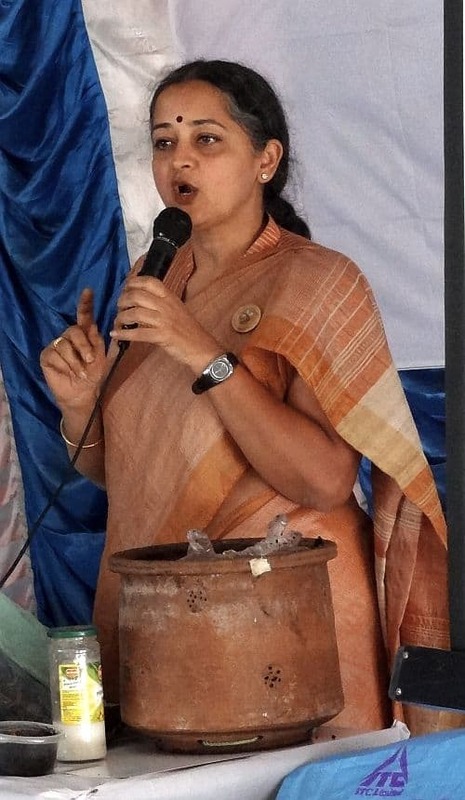 Vani Murthy from Malleswaram explained how one can start segregating waste and composting in their own homes easily. She gave a demonstration of materials that can be segregated everyday. For instance, dry leaves and vegetable peels can be separated and mixed with soil and shredded newspapers to create nutrient-filled compost for plants. The difference between recyclable and reusable materials was also explained. S Laxminarayan from Garden City Farmers Trust. Pic: Meera K.
The event was a platform for green enthusiasts to bond over their interests – gardening, no-plastic, organic farming and community well-being. Saravana, a chartered accountant, was one of the participants who had come all the way from Hanumanth Nagar to attend the event. Dr Vishwanath conducting the workshop. Pic: Meera K.
Questions to experts ranged from what plants can be grown in balconies with less sunlight, to how to take care of watering plants when one goes out on vacation. Dr Viswanath demonstrated a home-made water drip contraption that could help in the latter case. Stalls with themes relevant to the event were packed as well. Children and their family thronged to the chaat and snacks stall of In the Pink, an organic restaurant in BTM Layout. There were unique and surprising flavours of homemade jam from Nature in a Bottle that teased your taste buds – you could not resist taking home a bottle or two. Vani Murthy explains composting. Pic: Meera K.
Those looking to start their own kitchen garden were spoilt for choice on garden tools and seeds from Varsha Enterprises. Daily Dump had on sale a range of informative and cost-effective composting products and solutions for offices, homes and communities. Also present was Opron Biotech with digital diagnostic equipments like thermometers and blood pressure devices. All in all a satisfying and different way to spend a Sunday – one small step for the conscientious citizen. It was heartening to see pockets of change. The event was hosted by Celebrity Paradise Layout and ApnaComplex, with the support of Garden City Farmers Trust and media partner Citizen Matters. Get a refreshing start to your morning with your own garden! Bangalore weather is perfect for fruits, vegetables and flowers. Believe it or not, Namma Bengaluru beat Stockholm, Hong Kong, Orlando (USA) and others to come third in travel guide major Lonely Planet’s top cities to visit in 2012. London and Muscat are ranked one and two.